WILDSEA Europe is committed to working with the tourism industry in support of those operators who are committed to conducting their activities with environmental stewardship, contributing to ocean literacy and supporting marine research and conservation. Empowering tourism operators who take pride in integrating the natural values of their destinations as part of the value that they deliver to their clients is one of the key elements of our mission. Helping tourism operators to advance best practices in support of sustainable tourism is another key element of our mission, focusing primarily on interactions with marine wildlife but also addressing other relevant, important issues. Different operators have different levels of knowledge and skills to walk up the “sustainability ladder”. To that end, we have defined a rating system that is intended to serve both as an incentive and as a guideline to support them along this path. 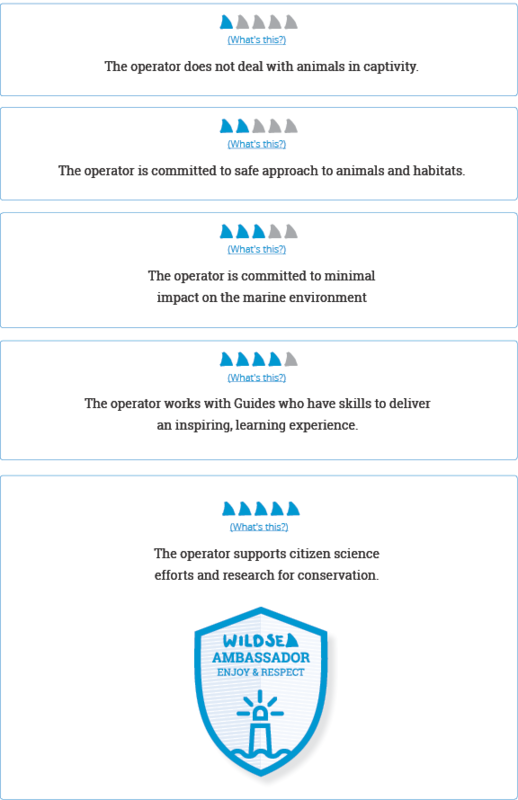 We also hope that this rating system will help our users reward the efforts of those operators who are working to contribute to a healthier ocean, as well as challenging them to live up to their commitment. While there are thousands of ways of assessing sustainability, we have chosen to focus on a few, key specific issues. Wildsea Europe only accepts members that rate above two “fins”. That means that we do not feature tourism experiences that deal with animals in captivity and that we do not engage with operators who are not committed to a safe approach to animals and habitats during their activity. The minimum rating required to operate with us is a 3-fin score. The rating that we assign to each operator is based on information that has been directly provided by each operator to us, through a simple questionnaire. While we work with public administrations and NGOs in each of our destinations to keep a close relationship with our member operators, we do not have the means to verify each and every one of them. So we rely on your reviews to assess whether our member operators are not only doing the talk, but also actually walking the talk. Those operators who are living up to their commitment will also appreciate your feedback, as it helps keeping our collective credibility in check. If you have any comments or questions with regard to our rating criteria, please feel free to share them with us!